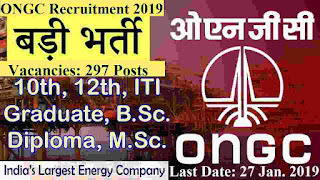 Fresh ONGC Careers Making Opening 2019 for all well qualified candidates for various job profiles. ONGC (Oil and Natural Gas Corporation Limited), is a “Maharatna” Public Sector organization under Government of India. ONGC is one of the major organization which is involved in Exploration and Production of Oil and Gas in India and abroad as well. As a result ONGC is a global player in energy, it contributes about 70% of India’s domestic Oil and Gas production. Presently, ONGC through its subsidiary ONGC Videsh is India’s largest Transnational Corporate with overseas investment of over 10 billion USD in 20 countries. ONGC offers one of the best compensation packages in cost to company (CTC) terms in the country with opportunity of merit-oriented advancement in a professionally managed organisation focused on growth. ONGC Careers making opportunities for all Indian applicants who are looking for a bright career. ONGC (Oil and Natural Gas Corporation Limited) invites Job applications from new and active Indian peoples owning Assam state domicile for selection to the under mentioned posts for ONGC’s offices in Assam with the pay scales as mentioned below. Most of the Jobs demand outdoor field work in shifts requiring considerable physical efforts and technical skills. The job is transferable to any location within the country as demanded by the semi-mobile nature of operations. 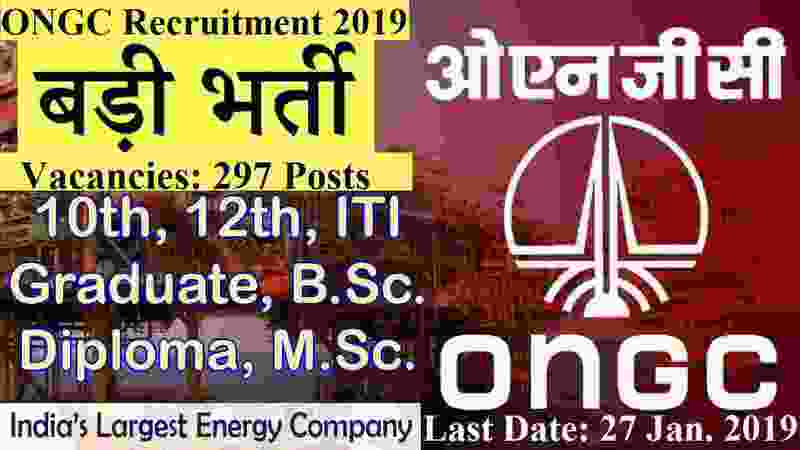 More information related to this ONGC Recruitment 2019 is given below in this article. Read it carefully before applying. Educational Requirement: 12th Pass, Diploma in Engineering, 2 Years ITI Course, BSc Graduates, Engineering Degree Holder, Post Graduates in Science Stream can apply for the Above job profiles which we explained above. Age Bond: Applicants age must be in between 18 years to 30 years. For more detail to know more about Age limits please check the official Advertisement whose link we attached at the Last of this article under IMPORTANT LINK section. i. For General/ OBC candidates- Rs 370/- as Registration fee (Fee- Rs 299.20/- plus GST-10.80/- plus Bank charges- Rs 60/-). Registration fee is non-refundable. ii. ONGC Departmental candidates/Tenure based employees would also be required to deposit the applicable registration/processing fee through the Challan form. However, the same would be reimbursable. iii. SC/ST/PWD/Ex-Servicemen candidates are exempted to pay any fee.